As a Londoner I have many skills. I’m able to look grumpy at all times, complain about the extortionate price of rent while I pay for artisan coffee and, most importantly, can stand on the tube without holding on to the rails and without falling over. 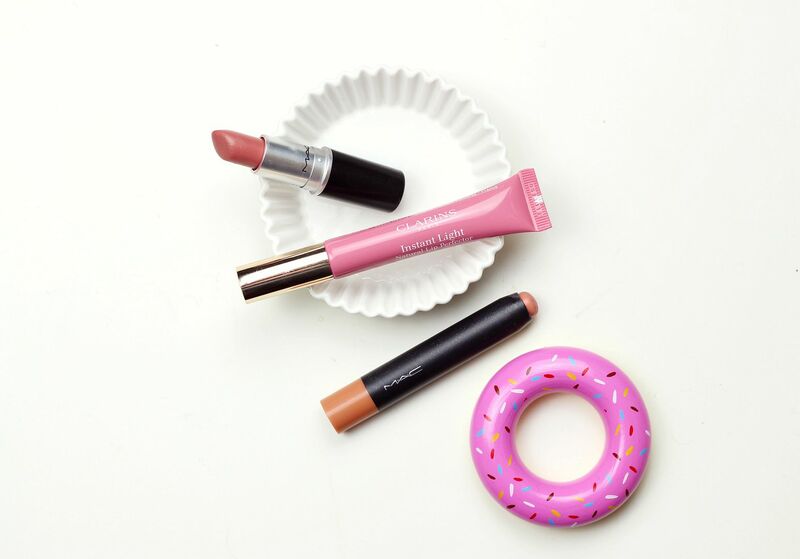 I need both my hands so I can apply lipstick on-the-go, basically. Some of my most-useful lipsticks are the ones that live in my bag and I’m able to apply in one quick swipe without looking in the mirror. Lipstick applications sans mirror is one of those valuable life skills along with the ability to never have windswept hair (haven’t mastered that yet) or never having mascara smudges (nope). Well, I had to have some MAC in the line-up didn’t I? Modesty is one of those gorgeous shades that makes the lips look polished and like you’ve made a lot more effort. It’s a creamy, comfortable texture and the shade is sheer enough that it can easily be swept on in one go. The colour is close enough to my natural lips that it doesn’t even really matter how neatly I apply it. The tastiest of the bunch – the Clarins instant light perfector in toffee pink shimmer. These are so easy to use, they’re just a moisturising balmy gloss in a squeezy tube – they manage to make the lips look fuller and this colour goes with anything. Best thing is the smell though – like actual toffee. If you’re into lip crayons, I really like the MAC patent polish lip pencils. They’re ridiculously easy to use – just scribble all over your lips and go. These are twist up as well, and everyone needs one in their handbag. If you liked this post you might like this post on clinique melon pop or this post on mac dita von teese. Four to try from Stila.